Walking home from work today, I passed a miserable looking clump of variegated phormiums in front of a drab public building. They were ill placed, unkempt and sorry for themselves, with dead leaves at their bases and spent flower spikes as stiff as javelins above. Regrettably seems to be the lot of these colourful Antipodean natives nowadays. How different things were 30 years ago. I remember my grandmother, a proper gardener with a taste for the unusual, purchasing her first Phormium, the basic Phormium tenax from a local nursery. Soon another and another followed, each with a different leaf colour or variegation. Considered tender and a bit special they flourished in the cool, damp Cornish climate. Phormiums fitted in surpisingly well with the surrounding camellias, heathers and conifers, adding welcome variation in foliage shape and colour. They still grow there today, years after grandma passed away, no longer mollycoddled, but nevertheless at home. 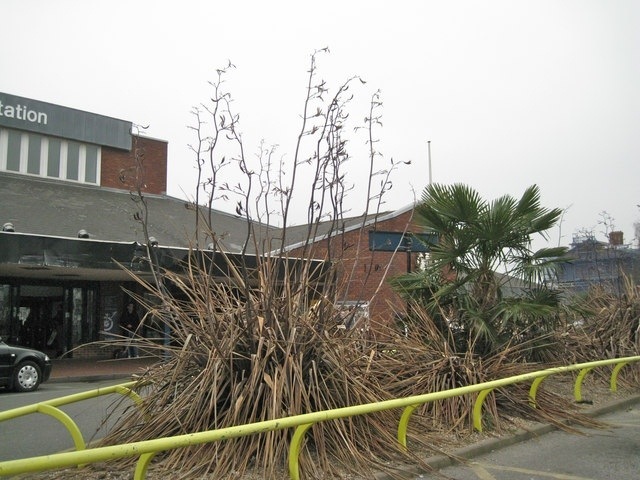 Today they have become the default plant for any landscape architect or local authority wanting to inject a touch of the “exotic” into a planting scheme. And, fair enough, they had generally proved themselves reliable and tough until last winter laid waste to many that were not properly protected. The sorry sight below greeted visitors to Derby station this February. At least the palm lived to tell the tale. And who are the landscape maintenance people who insist on chopping the leaves off about 3 feet from the ground every year, creating a flat-top of unhappy foliage? 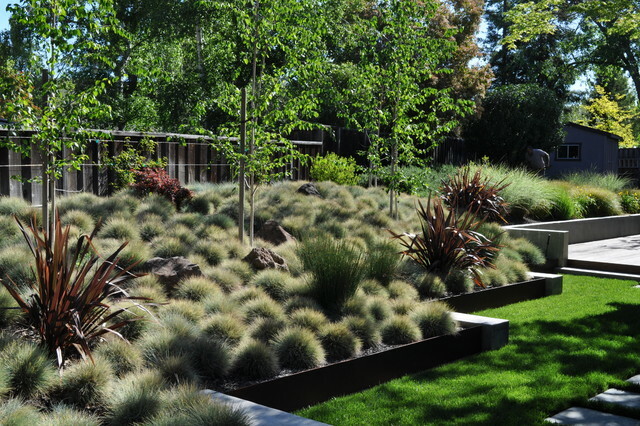 Now, sadly, I just can’t help associating phormiums with uninspiring, low maintenance planting design. That of course is unfair. 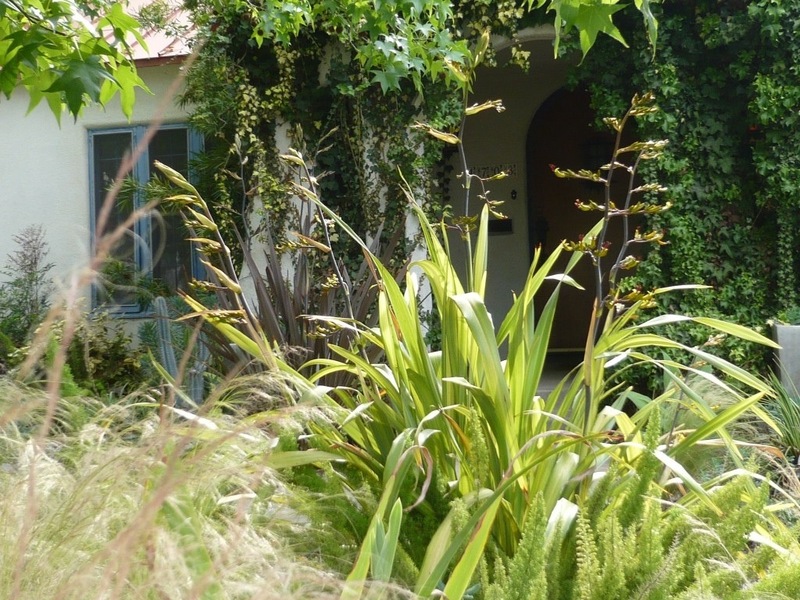 Used sensitively (as in the garden at the top of the post), with breezy grasses or ferny foliage plants such as Asparagus densiflorus they can be a wonderful architectural feature. Their evergreen leaves give a garden structure all year round and many will tolerate a large tub or container. This allows them to be moved to a sheltered spot over winter, although in most years a good mulch is all they need to see them through, followed by a nitrogen-rich feed in spring. The RHS online plant finder lists 101 species and varieties from good old “Sundowner” to newer hybrids, with leaves from almost black through to cream and red. So whilst I still prefer the more subtle Astelias and free moving Miscanthus for my vertical highlights, there’s no doubt that phormiums have a role to play in our gardens. It would just be nice if the landscape architects could give them a bit of a rest.